TORONTO — Canadian bantamweight Sarah (Cheesecake) Moras has a new opponent for the May 4 televised UFC card in Ottawa. The 30-year-old from Kelowna, B.C., was originally slated to face Leah Letson (5-1-0). But she has had to withdraw due to medical issues and will be replaced by fellow American Macy Chiasson. 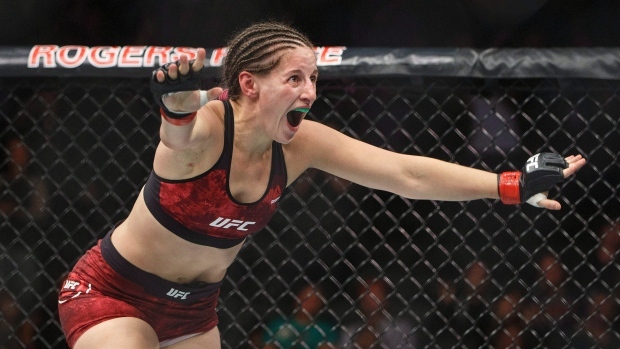 The 27-year-old Chiasson (4-0-0) won her UFC debut last time out, stopping Gina Mazany by TKO at one minute 49 seconds of the first round at UFC 235 on March 2. Moras (5-4-0) is 2-3-0 in the UFC. But her career has been interrupted by injury — she was sidelined 785 days by injury before she returned to submit Ashlee (Rebel Girl) Evans-Smith at UFC 215 in September 2017. Since then the graduate of Season 18 of "The Ultimate Fighter" has dropped decisions to Talita Bernardo and Lucie Pudilova. The main event at the Canadian Tire Centre pits No. 4 lightweight contender (Raging) Al Iaquinte against No. 7 Donald (Cowboy) Cerrone.